Hmm, where are those high-end Android smartphones that ZTE promised for the U.S. market? The ZTE Fury for Sprint is definitely not one. In fact, after examining its specs sheet, it becomes clear that it barely steps into the mid-range category. Those who are looking for an affordable entry-level smartphone, however, might like the ZTE Fury. It comes with a 3.5-inch display and a 1GHz single-core processor accompanied by 512MB of RAM. There is also a 5-megapixel camera on its back and 4GB of storage space are at your disposal. Android 2.3 Gingerbread comes out of the box, but whether an ICS update is being planned is anyone's guess. 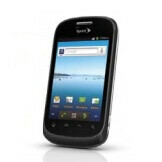 If the ZTE Fury seems like a device that you might consider getting, it will cost you $20 after a $50 mail-in rebate. A 2-year contract is required, of course. Expect seeing this one in Sprint stores starting March 11. Its being marketed as a 'Great Android Phone for Kids' from what I've seen. Seems more like a phone that I would see with Boost Mobile or Virgin Mobile. Come on Sprint, get it together.! I can upgrade in September, so I better see some better selection of phones when the time comes.! This is a great news, since more people prefer to use smartphone.